In two previous Journals we have published articles arising from a study of the Will of one of Wotton’s greatest sons – Sir Richard Venn. In this edition we publish the third and final account. However, to refresh your memories – or whet your appetites – a brief look back at those earlier stories. Venn, or as he was known in the sixteenth and seventeenth centuries, Ffenn, was a clothier who carried the raw cloth from our own and the sur- rounding areas to London and from there exported to Europe, the Middle East and beyond. As what was known at that time as a Merchant Adventurer, he attained considerable prominence and fame among the various livery companies and guilds including the Mercers, Drapers, Haberdashers, Grocers, and Skinners and was a member of two prominent trading companies, in particular the Levant Company and the East India Company. Venn was described as a Knight and Alderman of the City of London and became Mayor of that City in 1637. The Knighthood was bestowed by Charles I in 1638, three years after Venn wrote his now famous Will and in which he gifted to ‘the Mayor and parishioners of Wotton ……. one hundred ounces of silver plate to be used at the time of the Blessed Sacrament and my name to be engraven under the foot of the pots or cup’. Richard Fenn drew up his Will in 1635 by which time he had become a leading merchant in the City of London, being a member of the Haberdashers’ Company. It is impossible to estimate the extent of his wealth - he had amassed a fortune from his dealings in the East through the Levant Company, later through the East India Company, and to some extent, the Virginia Company trading with the new colonies in America. His interests lay in a wide range of commodities from spices including pepper, wool and fine cloths to ‘steel extracted from Swedish iron’. Moreover, he had acquired extensive properties with appurtenances, or leases thereto, both in the London area and in Gloucestershire (Wotton-under-Edge and Nibley). Indeed he was wealthy enough to meet the huge expenses required for the mayoralty of the City of London to which he was elected two years later in 1637. In his Will, written on 10th April 1635 but not ‘signed, sealed, published and declared’ by Richard until 13th January 1636***, Richard appointed ‘his most loving wife Jane’ Executrix and his sons, James and Robert, Executors. It was witnessed by Clement Mosse ‘my good friend’ (and also Comptroller of the Chamber of London, 1633), Thomas Clarke, Thomas Thornton and Thomas Worsley. 1. To his wife, Dame Jane Fenn, Richard left 1000 marks, equivalent to £666.6s.0d. in 1635 (£60,000 in present times*), together with ‘all the plate and household stuff yet remaining that she brought me when I married her’; also ‘a great chain of gold and divers jewels of good value which I bestowed on her, and all the nettwork for a bed, curtains valance and other furniture of nettwork or other work for her chamber’. She also received Richard’s coach and two horses and, perhaps more importantly, retained possession of the marital home in the parish of St. Michael Bassishaw (the area around Basing- hall Street EC1 and one of the wealthiest parishes in the City). Thus Richard ensured that she retained her status in the community and the standard of living to which she had been accustomed. 2. To his children: Established as merchants in their own right, James and Robert and their ‘heirs forever’ received bequests in land or property and rents therefrom rather than tangible sums of money. James was bequeathed all Richard’s ‘houses, tenements with their appurtenances situate in the parish of St. Michael nicknamed Crooked Lane in London’ (i.e. just west of Lon- don Bridge on the north side of the River Thames), together with a further three messuages or tenements with appurtenances in Silver Street. It would appear that the properties bequeathed to James were of greater value, since, in an effort to ensure that his property was ‘equally to be divided’ between his sons, Richard also left Robert freehold land in Essex and land, ‘albeit only a lease’, in Westham, Essex, in addition to messuages and ten houses in Fenchurch Street and St. Nicholas Lane in the City of London. Having previously provided for his daughter, Katherine, recently wid- owed on the death of Hugh Perry in December 1634, Richard bequeathed her the sum of £2,000 (equiv. £180,000) on the understanding that she made no further demands on his estate; possibly an interesting insight into Katherine’s character that he should make this proviso, as four years later on 16th August 1639, only two days before his death, Richard added a Codicil to the effect that neither Katherine nor ‘her now husband Lord Newburgh’ should make any dispute or further demands above the £2,000 already bequeathed otherwise she would invalidate this bequest. In his own Will of 1634 Hugh Perry himself referred to his wife as ‘being of quick disposition’. Equally, Katherine was to ensure that no challenge was made to her father’s Will either by Jane Fitzwilliam (the eldest daughter of Katherine and Hugh Perry) and her husband William ‘or by Edward Perry, the orphan of Robert Perry late citizen and mercer of London’ (and nephew and former partner of Hugh) or any of their respective administrators. 3. The third part of the estate was for Richard to dispose of freely as he wished. Gifts and bequests were made to friends, institutions and charities within and without the London community. Among such beneficiaries were St. Paul’s Cathedral Church - £100 (now equiv. to £10,000) for current repairs; the Churchwardens of St. Michael Bassishaw £20 (equiv. £1,800) for the relief of the poor; the Haberdashers’ Company £50 (equiv. £4,500) which was to be lent to a young man, especially a merchant venturer, for three years every three years in order to assist with his apprenticeship. Richard’s own appren- tices at the time of his death were to have their bonds returned to them, less any debts outstanding. St. Bartholomew’s Hospital, of which Richard was a Governor, was left £100 (equiv. £10,000). Provision of £40 was also to be made to the Governors for a dinner to be held on the day of Richard’s funeral. Christ’s Hospital - £30. The prisons at Newgate and Ludgate received £5 (equiv. £450) each and the two comptors (debtors prisons) £5 each. Two small cottages in the parish of Westham, Essex, or surrounding area, were bequeathed to the Churchwardens and parishioners, the rents from which were to provide relief to the poor of that parish by way of bread distributed every Sunday after evening prayer, and a further £10 was to be distributed amongst the poor of this same parish on the day of Richard’s funeral. Vari- ous friends and servants received bequests ranging from 40 shillings to £30, some specifying for the purchase of rings and mourning. Included amongst these friends was Mrs. Jane Aske, widow of James Aske and relative of Robert Aske, founder of the Haberdasher’s Aske’s Schools still in existence today, together with Richard’s ‘worthy friend Mr Justice Sutton, one of the Judges of His Majesty’s Court of Common Pleas at the Strand’. It was in this section of his Will that Richard provided for all his rela- tives in Wotton-under-Edge and disposed of his property there and in the surrounding area. We do not know how often Richard may have returned to Wotton but undoubtedly, businesswise, he kept close contact through lo- cally produced wool being sent up to London to be sold on. Moreover, in 1625 he provided apprenticeships to himself for at least two of his nephews from Wotton - Robert, son of his brother Henry, and Richard, son of his late brother William. In addition, he had been instrumental, with Hugh Perry, in bringing the water supply into the town, and he owned a house and land in Wotton (presently the site of Edbrooke House facing the War Memorial) held in tenure by his brother Henry, who had served as Mayor of Wotton in 1624 and 1625. This house and land passed to Richard’s eldest son, James, on Richard’s death. Mary, the widow of Richard’s elder brother William, who had served as Mayor of Wotton in 1602, and her children were provided for, Mary receiving 10 guineas, her son Arthur 2 guineas, and his sister £10; their brother Richard, Richard Fenn’s former apprentice, received 30 shillings as well as a yearly rent of £5 (equiv. £450) annually for life. Likewise Henry and Richard’s other siblings and their families all benefited from bequests of money and their outstanding debts to Richard cancelled. Also remembered were the children of Richard’s maternal Aunts Katherine Witchell and his Aunt (Jenny) Thomas, sisters of his mother, Edith, and all daughters of Wil- liam and Agnes Osborne of Wortley. Once again mindful of those less fortunate than himself, Richard provided for the poor of Wotton-under-Edge. So long as they were neither almsmen nor almswomen who had already benefited under the Will of Hugh Perry, the poor received £10 (equiv. £900) annually, paid quarterly on each of the main feast days i.e. in December at Christmas, on 25th March - the Annunciation of the Blessed Virgin Mary, 24th June - the birth of St. John the Baptist and 29th September - St. Michael the Archangel. Other kindred in need in Wotton or within three miles thereof ’ were to benefit from rents ‘arising out of the freelands at Nybley’ and ‘out of land in Wotton or Stinell’, likewise to be paid quarterly on the feast days. Four clerics were beneficiaries of the Will: to Dr. Clifford a ‘very good friend’ and Rector of St. Michael Bassishaw £10, and Mr. Leach, Minister of St. Mary-le-Bow on Cheapside, Mr.Smart Preacher, and Mr. Ackson, Preacher of Wotton-under-Edge, were left £5 each. Here in Wotton, the Mayor and parishioners received 100 ounces of silver plate to be used at the time of the administration of the Blessed Sacrament with Richard’s name ‘to be engraven under the foot of the pots or cups’. This was in the form of two flagons, both of which can be seen on display in the Treasury of Gloucester Cathedral. It was this one bequest that set in mo- tion research on a project which proved to be initially interesting and then, as gradually more information emerged, became utterly fascinating. Armed only with the name of ‘Sir Richard Fenn’ engraved on these flagons, we have gradually collected much information about this man who, apparently, went from a small town in rural Gloucestershire to the City of London, became a highly successful and leading member of the merchant community and was well-regarded enough to be elected Lord Mayor of the City of London; yet he remained mindful of the well-being of his entire family and a generous benefactor to those less fortunate than himself. There remain still many pieces missing from the puzzle. 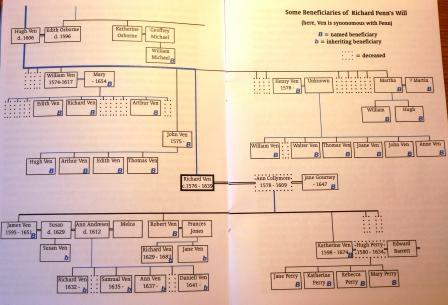 We have not yet discovered the exact date of Richard’s birth. According to Wotton parish reg- isters which exist from 1570, he was not baptised in Wotton. Nor is recorded the baptism of his elder brother, William. However, on studying the baptis- mal dates of Hugh Venn’s children which occurred regularly approximately every two years, two longer intervals become apparent - one between the baptisms of Arthur on 22nd February 1573 and of John on 28th March 1575 and then between that of John and Henry on 12th October 1577. Perhaps, we may then surmise that William was born during 1574 and Richard sometime during 1576. Clearly, his birth at any date after this would not fit in with the timescale of later events. Further, we do not know when Richard left Wotton for London. It seems likely that he went as an apprentice through family connections in the wool trade. He was entered into the Apprentice Book of the Haberdashers’ Company in 5th October 1593 under the sponsorship of Samuel Hare, who became Richard’s brother-in-law subsequently when Richard married Anne Collymore. For the moment these questions cannot be answered; we have carried out quite detailed research widespread from many sources, gathering infor- mation from the British Library, Guildhall Library, record offices, family Wills, as well as the College of Arms. We believe that we have enough evidence to show Richard as being very shrewd, but generous, well-respected and worthy enough to merit his burial on 5th September 1639 ‘in ye chancel’ of St. Michael Bassishaw**; in fact, a rather likeable man of whom his home town, Wotton-under-Edge, can be justly proud. It is not possible to provide a detailed bibliography for the time being as our snippets of information have been gathered from a great many sources. * All equivalent values in this article are approximate. Jennie and Terry Stevens have been volunteers at Tyntesfield since September 2002 and have been involved in the developments over the past sixteen years.